The Klamath Indian, Emma Jackson, who taught Mr. John L. Cox the other figures, also showed him this one. 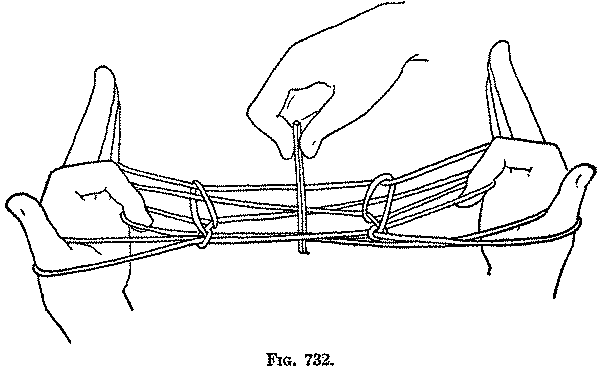 First: Put each hand completely through the untwisted loop. 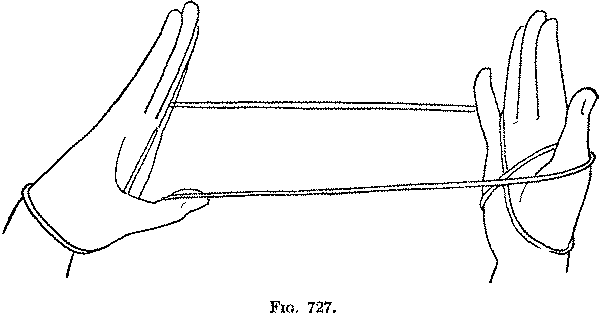 Bend each little finger down toward you, and pick up from below on its back the near wrist string, and return the little finger to its position (Fig. 726). Bend each thumb away from you, and pick up from below on its back the far wrist string, and return the thumb to its position (Fig. 727). With the right index pick up, from below, both strings on the left palm just where they cross (Fig. 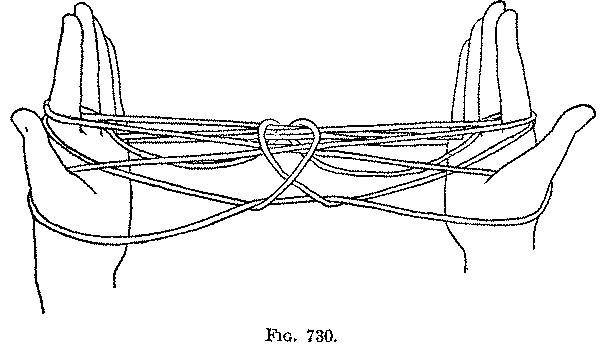 728), and separate the hands; with the left index pick up, from below, both strings on the right palm just where they cross, and separate the hands (Fig. 729). Second: With the right thumb and index pick up the string on the back of the left wrist, lift it over the tips of all the left fingers, and let it drop on the palmar side. With the left thumb and index pick up the string on the back of the right wrist, lift it over the tips of all the right fingers, and let it drop on the palmar side. 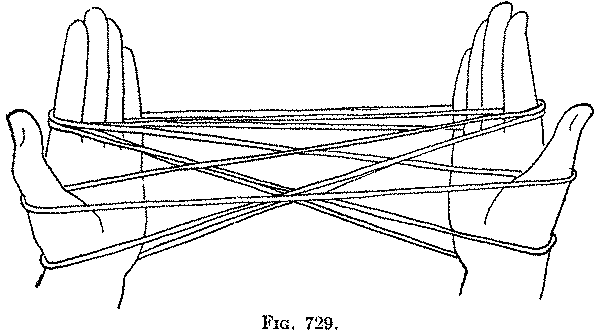 Third: Draw the hands slightly apart to separate the two strings which cross over the figure parallel with the palms (Fig. 730). 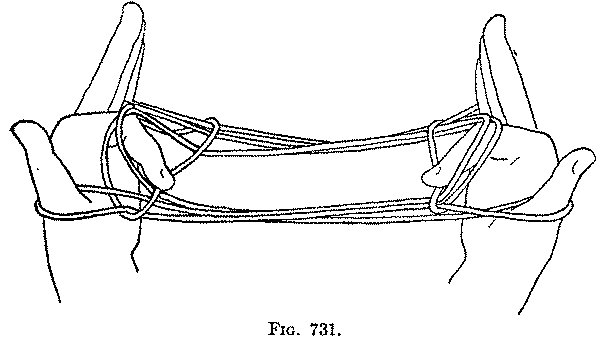 Bend each index down over the cross string of the same side, and draw the string toward the palm in the bend of the finger; allowing the two index loops to slip over the knuckles and off the finger (Fig. 731). Fourth: A second person now holds lightly a small piece of stick (a match for example) down into the centre of the figure (Fig. 732); if you now quickly let go the loops held by the index fingers, which represent the "boys," the stick, or "arrow," may be caught or snapped away. This figure is interesting because of the opening movement, a modification of Opening A, which does not occur in any of the other figures.